Your every [cosmetic] need satisfied for under $12! 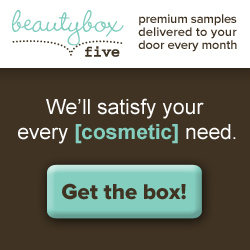 Beauty Box 5 delivers a monthly Beauty Box with 4 - 5 cosmetic samples directly to your door for a small monthly fee. Your Beauty Box includes a variety of sachet samples, deluxe samples and full size product! Your every [cosmetic] need satisfied for under $12 - Monthly beauty samples at your door - Get the Box!